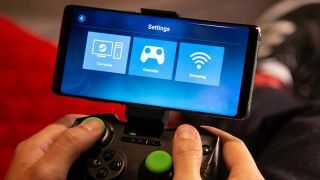 In early May, Valve surprised gamers with the announcement that it was bringing the ability to stream PC games to iOS and Android devices via a dedicated a mobile Steam Link app. That app was available for Android on the Google Play Store (albeit in beta form) immediately following the announcement, so owners of Google-powered smartphones and tablets can already get up and streaming, and Valve said that the iOS version would follow soon. On May 24, however, Valve came out and revealed that although it had initially approved the Steam Link app, Apple had since revoked that approval, meaning Steam Link's releaseon iOS was effectively in limbo. That might not be the end of the matter, however, as MacStories reports that the Cupertino firm may still be open to the idea of approving Steam Link for an App Store release. Initially citing “business conflicts with app guidelines that had allegedly not been realized by the original review team” as the reason behind the rejection, Apple’s vice president of Worldwide Marketing has emailed Steam users saying the company has “discussed these issues with Valve and will continue to work with them to help bring the Steam experience to iOS and AppleTV in a way that complies with the store’s guidelines”. Is the game on, then? Although Apple has opened a line of communication with Valve, that’s no guarantee that the Steam Link app will appear on the App Store any time soon. According to Apple, Valve broke App Store guidelines surrounding "user generated content, in-app purchases [and] content codes", meaning the reasons for rejection include some of Steam's most integral elements. Apple takes a 30% cut of all apps and games sold on its store, but with the Steam Link app allowing users to make purchases outside the App Store, Apple likely isn’t too happy about losing out on that revenue. To comply with Apple’s guidelines, Valve may have to make significant changes to exactly which Steam features iPad and iPhone users can access — changes that could severely limit the Steam experience on iOS, especially compared to what Android users can access. If Valve wants iOS users to enjoy PC-to-iPhone (or iPad) game streaming, it seems like some sacrifices are inevitable — we’ll just have to wait and see exactly what gets ditched to meet Apple's stringent App Store requirements.